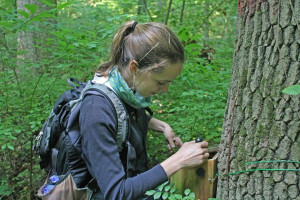 Delaware has one of the nation’s highest rates of Lyme disease per capita and the University of Delaware’s Solny Adalsteinsson is conducting a study that seeks to identify important ecological factors that contribute to the large number of infections. 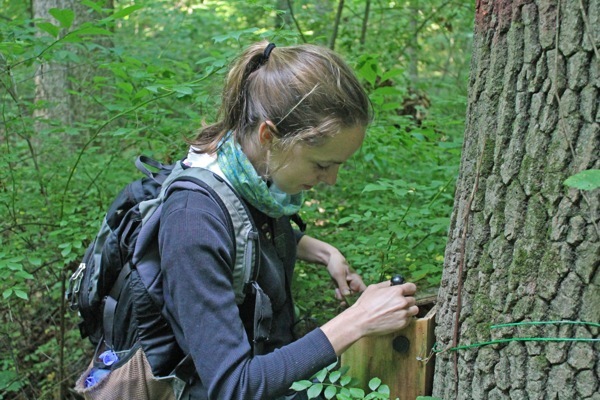 Adalsteinsson, a doctoral student in the College of Agriculture and Natural Resources’ Department of Entomology and Wildlife Ecology, is conducting her research as part of the Forest Fragments in Managed Ecosystems (FRAME) study. Looking at a group of forest fragments around New Castle County, Adalsteinsson is sampling ticks, mice and birds to determine factors in the forest fragments that influence tick-borne disease transmission and human disease risk. Adalsteinsson said that ticks have three life stages beyond the egg: larvae, nymphs and adults. They only feed once during each life stage so the ecological processes that influence which host they feed upon ultimately impact how many ticks are infected. “If a larval tick hatches out and feeds on a mouse — and mice are really good reservoirs for several tick-borne diseases — and if the larval tick acquires an infection during that blood meal, then it goes back into the leaf litter and molts and becomes a nymph and emerges the following year. When it feeds on its next host, that’s when it can transmit the disease or pick up a new one,” said Adalsteinsson. Invasive plants and mice When it comes to mice and the rate at which they transmit tick-borne diseases, Adalsteinsson said that a culprit might be an invasive plant, multiflora rose. “Multiflora rose may be facilitating that interaction and thus amplifying the number of infected ticks on the landscape. So I’m trying to get at that by first seeing if we find more ticks under multiflora rose than in areas without it, and I think that might be possible,” said Adalsteinsson. Multiflora rose is a highly invasive plant that takes over an area and covers it in a dense thicket. Ticks are sensitive to drying out and the dense thicket provides them a high humidity environment and stable temperatures, which explains why there may be more ticks living under the multiflora rose. It is an attractive environment for mice, as well. “I think mice also probably really like living in multiflora rose and that’s because it provides good cover from predators, and maybe even provides food in the fall when there are rose hips on it,” said Adalsteinsson. “I think mice in general would prefer any kind of thicker understory structure.” As a result, Adalsteinsson has set up nest boxes around local forest fragments as a way to look at “mouse occupancy.” “We measure the vegetation around each nest box and then we can see if those vegetation characteristics are influencing whether there’s a mouse occupying that immediate area or not,” she said. Air tick travel Birds have been identified as helping to expand the range of certain species of ticks and associated pathogens and because of this Adalsteinsson is also looking at how breeding season, when there is an influx in migratory birds in the area, impacts the disease transmission cycle. To do this, she is netting birds across the forest fragments and seeing if certain sections contain birds that have higher tick loads than others. She will also pull the ticks off and test them for pathogens. “We’re also tracking fledglings that spend a lot of time on the ground, catbirds and wood thrush in particular, and seeing if we can identify movement patterns that might explain how ticks are being moved across this type of landscape,” said Adalsteinsson. Tick species Adalsteinsson said that for the area in which she studies, which stretches from Mt. Cuba Center in the north to Glasgow Park in the south, there are two main species of ticks: blacklegged ticks, which also are known as deer ticks, and Lone Star ticks. The deer ticks are the ones that spread Lyme disease and are found in all of the study sites, though they are mostly found in the piedmont sites, which include UD’s Ecology Woods and the areas to the north, while the Lone Star ticks are only found in the southern forest fragments. “In our southern sites, we’ve found a lot of Lone Star ticks with really high population densities and we’re trying to continue that monitoring to see if they’re expanding their range or if they’re limited by some environmental factor,” said Adalsteinsson. In addition to UD associate professor Greg Shriver and assistant professor Jeff Buler, who serve as her co-advisers, and professor Jacob Bowman and supplemental faculty member Vince D’Amico, who serve on her dissertation committee, Adalsteinsson is assisted on the study by a large team of undergraduates, recent UD graduates and students from Pennsylvania State University, Denison University and the University of Vermont. Dustin Brisson, associate professor of biology at the University of Pennsylvania, serves on Adalsteinsson’s committee, as well, and she said that he has provided her with much guidance during the course of the project. As to how she became interested in the study, Adalsteinsson explained, “I just think it’s a really fascinating area because it’s such a complex system that in order to understand it, you have to know the whole ecosystem and all these moving parts. That really drew me to it. And, like a lot of other people around here, I’ve had Lyme disease a few times myself.” Article by Adam Thomas Photos courtesy of Solny Adalsteinsson This article can also be viewed on UDaily.